Saving the galaxy, rebelling against the Empire, and leading the Resistance are all important things to do when you become Princess Leia, but to do all that there's one thing you just have to nail. To get just right. To execute perfectly. Girl, you just gotta get your buns right! If you're worried about getting your hair in the right color and figuring out how to knot them in the iconic style of Leia Organa's hair in Star Wars A New Hope, then just make the right decision. 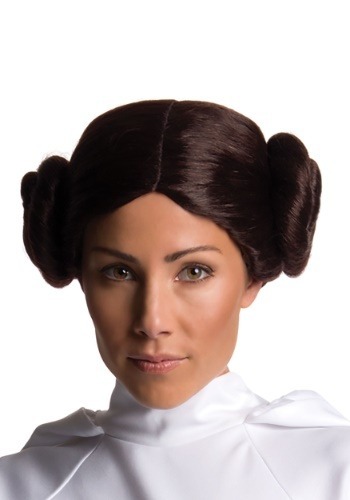 Just add this Secret Wishes Princess Leia Wig to your Star Wars costume. There's no need to fuss with your own hair when you can get a wig that recreates her look perfectly! You can board the Tantive IV and try to elude Darth Vader with the secret plans to the Death Star. Or you could join up with The Resistance to battle the First Order. Whatever mission you choose when you become Leia is going to be up to you. Cause with buns like these we're sure you'll be able to beat any bad guys!